LEDs are now a low cost option for making high quality and efficient darkroom safelights. However their performance is dependent on the selection of the correct types otherwise there is the risk of fogging. Not all red leds are the same and the selection of red / orange types is critical. Pure red LED's for orthochromatic (and multigrade) papers should be the super high efficiency or hyper red types with GaAlAs semiconductors. These have a low spectral bandwidth that does not extend below 600nm. Incorrect (and cheaper) LED's extend down to 550nm which will easily fog ortho papers. Another suggestion is to have red not clear packaging. There is a family of far red LED's which appear to cut off completely at 650nm and peak at 730 - 750nm. These are interesting for use as ultra safe ortho film safelights and also there is the possibility that they may be safe with normal panchromatic film. This will be tested at the earliest opportunity. LED's for Multigrade Papers are more difficult to source and should preferably be of the Red/Orange or amber types, not orange. The selection of suitable types is therefore limited, at the moment, to the Luxeon Rebel LXML-PH01-0050 red/orange 617nm high power led and the amber Osram LA G5AP which has now been tested and shown to be similar to the Luxeon. Both are surface mount so soldering is required. The links below is benchmark data concerning the performance of existing safelight filters. 2. Kodak Safelights Wratten 1A Light Red for orthochromatic and multigrade etc. Below is a selection of data sheets for super high efficiency leds. 5. Osram LS T676-Q2. Low power surface mount super red. 6. Osram LA T676-Q2. Low power surface mount amber, probably suitable. This is a preferred red/orange led. 2.9 lumen at 20mA, 120 degree angle, medium power, surface mount, easier to solder than the Luxeon Rebel and has now been shown to be suitable. However see the Prolite range below. These are much bigger than the typical surface mount types and are easily hand soldered. The red can be used for normal paper. The cherry red is a far red type which can be used for ortho paper or perhaps normal film. The use with normal film has still to be tested but their specification looks promising. This is now the preferred range for all applications. 9. Here is a super high efficiency led that is not suitable. I use a low cost commercial 13.8v/2 amp regulated supply as power source. This is distributed around the darkroom for a variety of uses. 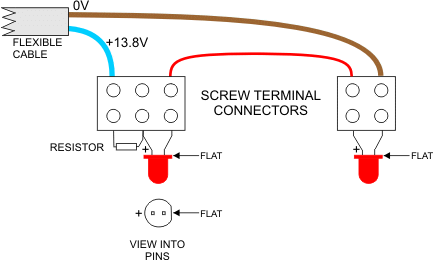 Use 1 or 2, 5mm red leds, L-7113SRD, with 3mA current. Use 1 Luxeon Rebel red/orange or red (50lm/W)with 3mA current. If the light is attached to the enlarger head the current can be switched to 1.5 or 6mA depending on the distance of the light from the easel. Typical light level is 1 to 2 lux using a normal luxmeter. 3. Main safelight above processing trays: Use 2 Luxeon Rebels (50lm/W) with 10mA current, spaced 0.7m above the trays and 1m apart. Here is a schematic relating to the 3 examples above and a suggested implementation for examples 1 and 3 is given at the end of the page. This section was modified on 2015/11/20. The use of a darker grey is more effective at revealing safelight fogging. Find the print time required to give a significant grey (reflection density 0.3 - 0.4) on the processed paper, which looks about half as dark as an 18% grey card. Expose further test samples in the same way and use these to check for fogging in various areas of the darkroom. A typical procedure would be to place a coin in the centre of a pre-exposed square test sample and expose each corner differently to give 4, 8, 12 and 16 minute exposure to the safelights. Process and when dry, compare each corner to the centre reference and other corners. With the above new test, and Ilford Multigrade IV filtered to grade 2, the above red/orange led safe lights, at a distance of 750mm, should allow greater than 8 minutes exposure before fogging is noticed. A similar test carried out with an Ilford safelight and 902 filter, at the same light intensity level, gave very similar results to the red/orange leds. Suggested implementation with no soldering.